The legend of Percy Flowers and the community known as Broadslab may be two reasons why Johnston County is considered the Moonshine Capital of North Carolina. At least, that’s what Broadslab Distillery owner, Jeremy Norris claims. Jeremy is a fifth-generation moonshiner, and the first legal one in the family. Broadslab Distillery offers tours of the distillery, tastings, a gift shop, and now a barn for weddings and special events. This “dirt to bottle” distillery is the only one in the state that grows the corn, harvests the corn, and makes the shine right on the farm. 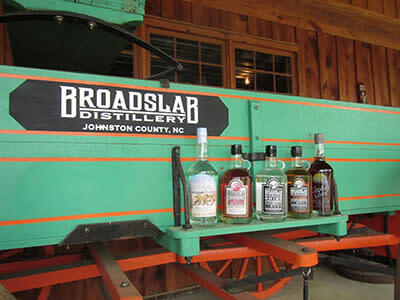 Broadslab is offering several top-quality “drinking” shines, an apple shine, and a regular rum and spiced rum product. Stop by and hear some of Jeremy’s stories, you won’t want to leave!